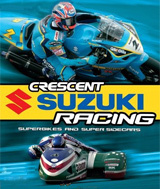 Only Crescent Suzuki Racing puts you in control of dozens of the meanest super bikes and super sidecars on the international circuit, including the GSX-R1000 of the 2004 British Super bike Champion John Reynolds and the fearsome super sidecar of 2004 World Champion Steve Webster. . Continued long game description second paragraph.It's by no means an easy ride though - chicanes, gravel traps and other hazards await you across the sixteen racing circuits and the ruthless skill of your computer opponents is sure to test your racing technique to the limit.